Rocky Hockey was a great training ground for me, and I enjoyed it immensely. My involvement began in 1977, when I had been at the Denver Post for less than a year. I was assigned to cover the Rockies, taking over the beat for the team’s second season in Denver. What follows — my recollections of Rocky Hockey, adapted from a chapter in “Playing Piano in a Brothel” — barely scratches the surface. The Rockies only made the playoffs once, the most games they won in a single season was 22, and they went through three ownerships and virtually from start to finish seemed to be in danger of folding or moving. The locker-room door was revolving, but some fine players and good guys passed through, and were often traded for each other. Jack Vickers, who went on to gain greater recognition in the sporting world as the patriarch of The International golf tournament, had purchased the NHL’s Kansas City Scouts in 1976 and moved them to Denver. Only two seasons old when it came to Colorado, the franchise had been under-capitalized and ineptly run as an expansion franchise in Kansas City. I truly believe the franchise would have had a better chance as a start-from-scratch expansion team, because the Scouts dug a hole and expectations would have been lower for a team implementing a patient building strategy, as a few previous NHL expansion franchises had done. Regardless, Vickers quickly realized that Denver wasn’t going to fill McNichols Sports Arena just because it was the NHL. Putting together an entertaining stretch run and beginning to capture the attention of the market in my first season on the beat, the Rockies (19-40-21) sneaked into the 1978 playoffs as the 12th and final qualifier in the 17-team league, lost to the Philadelphia Flyers in an entertaining two-game mini-series in the first round, sold out the home game, and seemed to kindle hope for the future. But Vickers undercut the momentum during the series by publicly bemoaning the team’s lease terms with the city. Soon, Vickers agreed to sell the Rockies to New Jersey trucking company operator Arthur Imperatore. Sure enough, the NHL quickly made it clear it wouldn’t commit the Meadowlands to Imperatore. It was planning to award New Jersey as an expansion market. Imperatore went through with the purchase of the team and put his stepson, Armand Pohan, in charge. Pohan was brilliant, and one of the reasons I liked him was that he pretty much admitted that he and his stepfather had been naive when they bought the team. They tried to make the best of it; they really did, in part because to do otherwise would have been financial lunacy. Second-year coach Pat Kelly (he went on to re-found the East Coast Hockey League, and its trophy is named after him) was fired during that 1978–79 season and affable team executive Aldo Guidolin finished it out as the interim coach. The record was an abysmal 15–53–12, erasing all the momentum of the previous season’s playoff berth. Arthur Imperatore, Armand Pohan, and general manager Ray Miron decided they needed to do something dramatic. To fill the coaching vacancy, the Rockies hired Don Cherry. In later years, Cherry—“Grapes”—went from well-known as a coach to legendary as a broadcaster. A fixture on Hockey Night in Canada’s “Coach’s Corner,” the bombastic Cherry spouted off, in both loud voice and loud suits and sport coats. His “Rock ’Em Sock ’Em” videos are huge sellers in Canada. He’s a watchdog for old-fashioned, old school Canadian hockey values and is variously revered or ridiculed for his reluctance—no, his refusal to evolve with the game and the times. His fame is international and his influence immense. None of this might have happened if his stint with the Rockies had gone better. I enjoyed covering him, and I have to say that he was a beat writer’s dream. Cherry had just left Boston, where he and general manager Harry Sinden had a venomous relationship that led to Cherry’s exit after a semifinal round playoff loss to Montreal—one that included a too-many-men-on-the-ice penalty on the Bruins in the final two minutes of regulation in the deciding Game 7. The Bruins were ahead by a goal at the time, but the Canadiens tied it up on a power play and won the game in overtime. Regardless, Cherry’s record at Boston was impressive. The belief that the players universally loved him was misleading. Those who were among his favorites indeed embraced him — in fact to a degree I never had seen before nor have seen since in covering major-league sports. Those on his bad side bit their tongues and played on. He got into coaching by accident. After a journeyman’s career in the minor leagues—he got into one playoff game with the Bruins in 1955—he tried his hand at construction. When he was laid off, Cherry didn’t have a nest egg from his playing days. Because of his need for a job—any job—the stocky defenseman went back to the Rochester Americans at age thirty-seven in the fall of 1971. The Bruins hired Cherry in June 1974. In five seasons, he was the NHL’s coach of the year once and got the Bruins to the Stanley Cup finals twice, and the Bruins lost to the Canadiens both times. His accessibility and shoot-from-the-hip style increased his popularity. “It seems like I served my apprenticeship in the minors as a general manager and coach,” said Cherry. He brought his beloved wife, Rose, and his famous white pit bull terrier, Blue, a gift from the Bruins’ players, with him to Denver. He also came with a reputation for sartorial excellence, and this was before his wardrobe tastes took bizarre turns. The Rockies signed Cherry to a two-year, $180,000-per-year contract. “I’m just a guy who likes to go out and have a good time with the players,” he said. “Somebody asks me how we win so much. It’s the players. First and foremost, everything’s got to be for the players. If the players aren’t with you, you’re dead. I don’t know; if I knew what I was doing, I’d probably screw it up. Cherry immediately was a sensation in Denver. Much of it was his flamboyance, and he had most members of the media in the palm of his hand. (Including me.) He was a great sound bite for the local television folks, who started showing up at games. I appreciated that he offered colorful quotes, was always cooperative, and actually enjoyed having a few beers with the scribes on the road occasionally. I was wide-eyed when he took Fred Pietila of the Rocky Mountain News and me to Toe Blake’s tavern in Montreal and told stories for a few hours. The Rockies had the first overall pick in the 1979 draft, an incredible opportunity because four World Hockey Association teams—-Edmonton (with a teenage Wayne Gretzky), Quebec, Hartford, and Winnipeg-—finally were coming into the NHL. The two WHA teams that didn’t make the cut and were folding, Cincinnati and Birmingham, also had players who had been too young to play in the NHL under its previous 20-year-old cutoff, so they were included in the NHL draft pool. Four of Birmingham’s “Baby Bulls” went in the first round, including defenseman Rob Ramage to the Rockies, the number one choice overall. Ramage had a solid career, and the consensus at the time was that it was the wise choice. The other Baby Bulls who went in the first round were Rick Vaive, Craig Hartsburg, and Michel Goulet. Goulet and former Cincinnati Stinger Mike Gartner, who went to Washington, are in the Hockey Hall of Fame today. So is a young defenseman from the Verdun Eperviers named Raymond Bourque, who went to Boston in the number eight slot. Cherry didn’t have the patience for a step-by-step team-building effort. Before long, the coach was sniping at Miron, both in public and private. Miron acceded to some of Cherry’s requests, acquiring a couple of veteran players who fit his style. One of the ironies of his stay was that despite his image—cemented during his days on television—as being suspect of French Canadian players, he was all for the preseason acquisition of Rene Robert from Buffalo. Robert had been on the Sabres’ famed “French Connection” line, and he quickly became one of Cherry’s favorites. But the Rockies’ approach was misguided, primarily because they didn’t decide on a coherent strategy and stick with it. Instead, they were stuck in a no-man’s-land with a hybrid and capricious philosophy, including periodic attempts to pacify Cherry or quiet his complaining with the acquisition of hard-working journeymen with more grit than talent or aging veterans. After a 1-7-2 start, the Rockies traded their best young player-—intimidating defenseman Barry Beck-—to the Rangers. For Beck, the Rockies got a package that included defenseman Mike McEwen and Dean Turner, plus wingers Lucien DeBlois and Pat Hickey. Beck had been the Calder Trophy winner as the league’s rookie of the year in 1978. Shoulder problems later slowed and then ended his career, but trading a young cornerstone defenseman who could score goals—he had a dynamite shot from the point-—and help shut down opponents was a sign of panic. Cherry supported the trade, saying that if the Rockies didn’t get some goal scorers, there was no hope. The day the deal was announced—ironically, the day before the Rockies played and beat the Rangers in Denver with a stunned Beck, a western Canadian boy who was having a home built near Evergreen, going through the motions—I saw Cherry and Miron walking down the hall in front of me. Cherry actually patted Miron on the back. That might have been the last time that ever happened. The trade actually made some “sense,” since its ripple effect tied it to the later deals that brought Lanny McDonald and Chico Resch to the Rockies and at that point, the multiple players acquired improved the roster as a whole. McEwen, DeBlois and Hickey were bona fide NHL standouts, if not stars. But if the Rockies had kept Beck, I’m convinced he and Ramage soon would have been one of the league’s elite defensive pairings — and stayed that way for a long time. On Nov. 28 in Denver, nearly four weeks after the Beck trade, the Rockies were part of an NHL historic moment — the first time a goaltender was credited with a goal. A delayed penalty was pending on the Islanders, and Colorado goalie Bill McKenzie went to the bench. Ramage, who had pinched in, passed back to the point, but no teammate was there and the puck slid to the other end, into the Rockies’ net. Smith got the goal because he was the last Islander to touch the puck, but it took a scoring change after the game to get him the goal, and the Islanders already had left the building when the news broke. The Denver Post was an afternoon paper at the time, and I was astounded when Smith answered the phone in his hotel room — before charter travel, teams stayed overnight in the road cities after games — and was more than willing to talk about it. (He might have had some post-game libations by then, I suspect.) He joked that by the time he could tell his grandchildren about the historic first goaltender goal, he would say he made a spectacular play and a shot — and nobody would remember enough to contradict him. A few days later, on Dec. 2, 1979, Cherry returned to Boston Garden with the Rockies. Incredibly, the Rockies led 4–2 with 53 seconds left. With a faceoff about to take place in the Colorado zone, the Bruins brought goalie Gilles Gilbert to the bench—and Cherry called a time-out. During the timeout, Cherry didn’t huddle with the Rockies to talk strategy. He let them rest and get drinks of water. He stepped to the end of the bench and began signing autographs for the fans who had gathered there; that, of course, brought more fans in their wake. It was one of the funnier scenes I’ve ever witnessed in sports, in part because it was so brazen. I was just across the ice, because the hockey press box at the Garden was a front row appendage to the low balcony. A “Cher-ry, Cher-ry” chant began and continued through the time-out. The Bruins still were 15–6–3, but Cherry admonished the Boston press not to forget that the Bruins had gotten off to a 16–2–2 start under him the previous season. Later in December, the Rockies traded Pat Hickey (from the Beck trade) and Wilf Paiement to Toronto for McDonald and a young defenseman named Joel Quenneville. Although Paiement—the franchise’s first-ever draft choice when the team was based in Kansas City—was talented, it was a good deal, primarily because cantankerous Maple Leafs owner Harold Ballard wanted to exile McDonald to Siberia. And that’s what NHL traditionalists thought the Colorado franchise was at the time. McDonald was a leader and a terrific player who played with passion and heart, and his bushy mustache made him hard to miss. Soon, McDonald was the Rockies’ most prominent player ever, and—aside from Cherry—its most eloquent spokesman. But on the ice, little went well. The goaltending indeed was bad, but in retrospect, I probably concurred too easily with Cherry’s position that Hardy Astrom, who was acquired from the New York Rangers and making decent money, was the worst NHL goalie of all time. A handful of others in the league who played twenty or more games that season had worse goals-against averages than his 3.75, and there were even a couple who played more than half their teams’ games—Hartford’s John Garrett and Los Angeles’s Mario Lessard. Regardless, Cherry held his nose long enough to use Astrom—yes, management and ownership wanted him out there, but Cherry could have defied them—in forty-nine games, while also trying Bill McKenzie, Michel Plasse, and Bill Oleschuk in the net. In February, the Rockies had to settle for a 4–4 tie at Hartford when Plasse had only 17 saves. I felt as if I were covering the Washington Generals, the Harlem Globetrotters’ foils and straight men, when the Rockies were the opposition in the March 1, 1980, game that was “Miracle on Ice” goaltender Jim Craig’s NHL debut for the Atlanta Flames in the Omni. In Atlanta, the Flames had their first sellout of the season (15,156), everyone waved American flags, and the Flames probably could have beaten the Rockies using Cherry’s “guy who works in the confectionary store” as their goaltender. In the story, I said they could have used Eric Heiden, who had just won a big haul of speedskating gold medals but probably wouldn’t have been helpless in the net. The Rockies’ first shot didn’t come until 12:50 of the first period, and McDonald took it from near the red line. The Flames won 4–1. Craig seemed fazed by only one thing: the Confederate flag one fan waved behind one goal. Surely Craig was on his way to NHL glory, right? He wasn’t. He wasn’t playing the Rockies every night. Next, I called Pohan. “I don’t understand why things reached this point,” he said. I asked him if this was a sign of a deteriorating relationship between the team and Cherry. “No comment,” Pohan said. McEwen did come back to the team and finish out the season. Bobby Schmautz is barely visible at the right as he and Paul Stewart meet in the hallway. That’s Lanny McDonald watching. The incident in Boston when Cherry signed autographs during the timeout was funny. What happened in Denver in late March was bizarre. The Rockies were playing the Quebec Nordiques when Quebec’s Paul Stewart and Colorado’s Bobby Schmautz, a former Bruin and one of Cherry’s all-time favorites, drew minors for high-sticking in the first period. They served their penalties and then were given game misconducts when they waved their sticks at one another in a faceoff. Before the game could start again, other players raced off the ice—the exits at McNichols were in the corners, across the ice from the benches—because they had figured out Stewart was chasing after Schmautz in the hallway. So the crowd was left wondering what was going on as the game was delayed. Stewart and Schmautz had a brief stick-swinging duel in the hallway between the two locker rooms. Schmautz was scornful of Stewart. “This is the guy who came up earlier this year and got beat up and sat in the penalty box giving the ‘V’ sign because he’d fulfilled his dream to play in the Boston Garden,” Schmautz said. By the time the Nordiques became the Colorado Avalanche, Stewart had found another line of work. He was an NHL referee. The Rockies finished 19–48–13, and their 51 points were the lowest in the 21-team league. Their average home attendance was only 9,754, but that was a huge increase over the average of slightly more than 6,000 the season before. On the ice, the good news was that McDonald, then only 28, had 25 goals in only 46 games for Colorado and an aura of leadership (and the mustache) that seemed to stamp him as the franchise’s public face—at least among the players—for years to come. The day after the season ended, I called Pohan to do a season wrap-up and casually asked if ownership was considering firing Cherry. Despite the fact that the strains between ownership and Miron on one side and Cherry on the other were obvious and well documented, I really didn’t think the Rockies would fire the popular coach. Much to my surprise, Pohan said, yes, he was considering doing just that, emphasizing it was in the process of evaluating the entire operation, including Miron, as well. Cherry also said he didn’t think the Rockies were that far off from being contenders; they were heading in the right direction and had made huge inroads both at the gate and in gaining attention in the marketplace. It took seven weeks for Pohan to announce his decision. He fired Cherry. It did take courage, considering Cherry’s support was vocal and widespread. My biggest criticism was that Cherry’s track record for being uncontrollable and outrageous was well-known when the Rockies went after him, so they should have known what they were getting and tried to ride out at least the final season of his contract to see what happened. After trying to let the furor die down, Pohan had decided that the situation was just too toxic. Imperatore and Pohan deservedly had the reputation for being great employers in the trucking business, and they expected loyalty in return—not realizing that professional sports often didn’t work that way. Cherry threatened to take a year off, which would have forced the Rockies to pay him. He did that work for Hockey Night in Canada in the playoffs, started out as an analyst the next season, and then was moved into a role that better suited him—the studio pundit’s role on Coach’s Corner. His ridicule of his Rockies’ goaltender, Astrom, has made the man the former coach calls the “Swedish Sieve” one of the working definitions for ineptitude in the net—as Mario Mendoza and the “Mendoza Line” became references to bad hitting. For years, Cherry occasionally took shots at Miron, long-ago retired and living in the Tulsa area after making a fortune as one of the founders of the revived Central Hockey League, which now awards its champion the Ray Miron Presidents Trophy. Arthur Imperatore owned the Rockies only a few months longer. I had lunch with Imperatore and Armand Pohan during the 2003 Stanley Cup Finals at the Imperatore-owned New York Waterway’s port station in Weehawken. “We bought that team to bring it here,” Imperatore again acknowledged. “Know what would happen? Usually, I’d work half the day because I’m a workaholic. I’d get off the airplane, get a headache first thing. A bad headache. Then I’d get a nosebleed. I’d go the arena and meet the guys and talk to them about how well we were doing. And then came the clincher. You’re tired, it’d be 9 here when the game started in Denver, and it’s about to begin, and I’m looking around asking, ‘Where are the fans?’ They’d come trickling in. All I can see are the empty seats. Then, the game would start, the other team scores the first goal, and I think of how many more empty seats there are going to be the next game. And, sure enough, that’s what happened. Imperatore smiled again and provided his own answer. “I guess we didn’t have much of a team,” he said. To replace Cherry, the Rockies hired Billy MacMillan, a former player and assistant coach with the then-successful New York Islanders. Miron stayed on as general manager. On November 30, 1980, the Rockies played at Buffalo. Pohan attended the game, and he later confirmed what happened in the VIP room after the first period at Memorial Auditorium. Sabres owner Seymour Knox introduced him to Peter Gilbert, a Buffalo cable television magnate and Sabres’ season-ticket holder. “You’ve got a deal,” Gilbert said. Gilbert was born in Austria, and he said his family had gotten out of that country in 1933 and made it to British-controlled Palestine. He joined the British Army late in World War II, served in the Israeli Air Force after the postwar founding of the modern state of Israel, and moved to the United States in 1950, when he was 24. In a Brooklyn machine shop, he started out as an office boy and ended up buying the company and turning it into an electrical components company. That company merged with Alloys Unlimited, and Gilbert made a considerable profit. In 1970, he bought a bankrupt Long Island cable company from a bank, and it exploded when he talked Madison Square Garden into awarding his system the rights to Knicks and Rangers games—in the forerunner of the Madison Square Garden Network. He sold that cable network to Viacom for $12.5 million and reinvested in another struggling cable company, this one in Buffalo. That also boomed. Today, I’m convinced those were the reasons he bought the team. He was a cable pioneer and had a track record in the industry, he knew getting that Denver cable franchise would be a gold mine, and either separately or in combination, he already had made a ton of money by being ahead of the curve in utilizing teams as showcases for a regional cable network. (He was thinking of Altitude … way back then. That’s why he later publicly explored buying the Nuggets, then owned by a large group of mostly local investors who within a few years sold out to Texan B.J. “Red” McCombs.) But none of those cable plans came together, or at the very least, Gilbert realized the process would take years. Late that season, with Gilbert in control of the franchise, the Rockies finally acquired a good goaltender in a trade with the Islanders. Colorado picked up Glenn “Chico” Resch and young center Steve Tambellini for Cherry’s favorite, Mike McEwen. Nothing much changed under Gilbert, at least on the ice. In the wake of a fifteen-win season in 1980–81—a season that made the Cherry season look good—Miron was fired. MacMillan, despite his lack of success as the coach, had impressed Gilbert, and he was championing the successful model of the “Islanders Way.” MacMillan stepped up to become GM and hired a former Islanders teammate, Bert Marshall, as head coach, with University of Denver coach Marshall Johnston coming aboard as an assistant coach and assistant general manager. Here’s the Rockies' 1980-81 price scale. Gilbert hadn’t reacted well to the realization that he had a fiasco on his hands or that he was losing money by the bushel. By November, Lonnie . 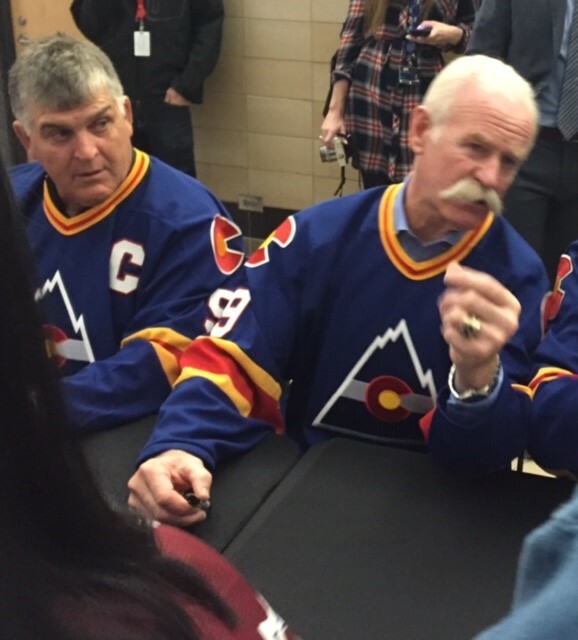 . . er, Lanny McDonald was refusing to talk to me because he felt I violated a confidence. He came to Denver with a contract from Toronto that ran through 1982–83, but much of it was based on the assumption he would be playing in Canada, where he had made a lot of money on endorsements. He also maintained that Imperatore and Pohan had promised him the deal would be renegotiated after the 1980–81 season if he performed well. I heard that he was asking Gilbert and MacMillan to honor that commitment, and McDonald said he had no comment on the record but confirmed it off the record and asked me not to write about it because he expected it to be taken care of quietly and soon. He said he would let me know when that happened. His agent, Alan Eagleson, initially wouldn’t talk about it, either. The problem was that the grapevine was hard at work. It was common enough knowledge and soon I had heard it from enough people to feel as if I had to write about it, and I told him I was doing so. Then Eagleson, also the head of the Players Association and eventually shown to be a crook, confirmed it publicly. McDonald’s anger over Cherry’s firing. He said he had told McDonald that the team would consider renegotiating the contract in the 1981 off-season if McDonald proved he deserved a raise and if the team’s financial condition had improved. The airing of that dirty laundry didn’t please McDonald, and he gave me the silent treatment for at least another month. The Rockies reacted by trading him. On November 24, 1981, the Flames—by then playing in the 8,700-seat Calgary Corral while the Saddledome was under construction next door—blew out the Rockies 9–2. The next morning, we went to Winnipeg—and I say “we” because in the fashion of the time, I traveled with the team on buses to and from airports and on commercial flights. Noticeably, Billy MacMillan and Bert Marshall weren’t on the team bus to the Calgary airport or on the flight to Winnipeg. Marshall Johnston told me they were coming on a later flight. I was the only writer on the trip—the Rocky Mountain News was being more selective about following losing teams—and I asked Johnston if that meant a trade was in the works. He was vague, and I went to the pay phone and tried both MacMillan and Marshall’s rooms back at the Calgary hotel. They didn’t answer. At the Winnipeg airport, McDonald, who was sitting near the back of the plane, was one of the last ones off. An Air Canada agent met Johnston with a message. As the other players headed for the baggage claim area, I saw Johnston intercept McDonald and take him to a pay phone. Soon, the other players were all on the bus, waiting, when they noticed that McDonald and Johnston weren’t aboard. Tambellini was designated to find out what was going on, and when he went back in the terminal, he saw Johnston struggling to get his phone credit card number to work and get his call through and McDonald sitting, waiting, and looking forlorn. That was Rocky Hockey in a nutshell. Finally, Johnston reached MacMillan and handed McDonald the phone. He had been traded to Calgary, along with a fourth-round draft choice, for Flames forwards Bob MacMillan—Billy’s brother—and Don Lever. When he got off the phone, he filled in Tambellini, who was noticeably distraught. We agreed that I’d ride with him in a taxi to the Winnipeg Arena, where he was going to pick up his equipment, and talk to him there before he headed back to the airport to catch a flight to Calgary. He boarded the Rockies’ team bus, and he later said in his autobiography that when he broke down talking to his teammates, Rob Ramage told him to shut up because he would figure out this was the best thing that ever could have happened to him. I asked McDonald if his request for a contract renegotiation was the cause of the trade. “If it did, they’re crazier than I thought,” he said. It wasn’t long before he figured out that Ramage was right. He was a Medicine Hat, Alberta, native. He was going home. But on that day, McDonald was crushed to be leaving the Rockies. He and his wife, Ardell, truly did love living in Denver. The trade itself didn’t seem as ridiculous at the time as it might seem in retrospect—and it especially looked ridiculous when McDonald scored 66 goals for Calgary only two seasons later. Bob MacMillan and Don Lever were solid all-around forwards. MacMillan had 75 goals in a two-season span for the Blues early in his career, and Lever was coming off a 30-goal season. But the fact that one of the players acquired for the franchise’s most visible and best player was the general manager’s brother raised a lot of eyebrows, as it should have. In retrospect, I came to the conclusion that, after all the other trials and tribulations, Rocky Hockey finally lost any chance of surviving in Denver the day McDonald was traded. Gilbert barely had owned the team for a year when it was obvious he didn’t have the stomach for the continued losses. To his credit, he kept writing the checks and the franchise never was in danger of folding, but at meetings in Washington held in conjunction with the early February All-Star Game, he officially told the league he wanted to move the Rockies to New Jersey. That was an issue again because the new Meadowlands arena finally was on the verge of opening. The meetings went so long and Fred Pietila and I had so much to write that neither of us made it to the All-Star Game itself. The league put Gilbert on notice that at the very least, he had to exhaust all avenues in finding a buyer who would keep the team in Denver. In the final month of the season, there was a brief glimmer of hope. A St. Louis high-risk insurance mogul met with Gilbert and was championed as a possible owner by a Colorado-based member of the Rockies’ board of directors—a group that was largely window dressing as Gilbert attempted to defuse the issue of absentee ownership. One day, though, I took a call from St. Louis, and the caller suggested I check out two of the mogul’s companies. With a lot of help from folks in the Missouri Secretary of State’s office and other sources, I ended up with mountains of material about the mogul’s companies and lawsuits and about the Missouri Division of Insurance accusing one of the companies of misappropriating $166,595 in premiums. I also came up with photocopies of two $150,000 checks to a lawsuit plaintiff that bounced. And this guy was going to buy the Rockies? I went to St. Louis and visited the insurance mogul at his offices, and he was cordial, downplaying the significance of the checks and saying he still was interested in buying the Rockies. I wrote smaller news stories about all of these findings and had a major Sunday package, including a question-and-answer piece with the mogul, ready for publication when he sent a telegram to Gilbert and the Rockies “withdrawing” his offer. We still ran the Sunday package on March 28, 1982, including a picture of one of the bounced checks, under the headline: “The Man Who Almost Bought the Rockies.” That probably wasn’t accurate, though. It was obvious to me that he never would have been able to pull off the purchase. Even if I hadn’t written a word about his business dealings, that still would have been the case. So I never felt that I had anything to do with “scuttling” a deal. But it all was so Rocky Hockey. It was too late. Edmonton furniture and real estate magnate Bill Comrie was the major figure in a group that talked about buying 70 percent of the franchise with local ownership retaining the remaining 30 percent. That deal also fell apart and for a bizarre reason. With the deal under discussion in mid-April, an armed intruder burst into the home of Edmonton Oilers owner Peter Pocklington, who was trying to broker the sale, and demanded $1 million in ransom. Police eventually shot the extortionist, but Pocklington was grazed in the arm in the crossfire. Shaken, he had better things to do than to help close the sale that would have kept the Rockies in Colorado. At least I got a couple of trips to New York out of it. In mid-May, the NHL’s board of governors met for two days in Manhattan, failing to agree on the Rockies’ fate or what to do with the Meadowlands market. Gilbert proposed simply being allowed to move the Rockies there, but it was obvious the NHL wasn’t going to allow that to happen. Millionaire John McMullen wanted either the Rockies or an expansion team for the Meadowlands, and the debate mostly revolved around how the league could allow the Rockies to go New Jersey and still get the same amount of money it would get from expansion fees if an expansion team went there. Every time Gilbert walked out of the room, I was in the mob chasing him down for comment, even if he was just taking a restroom break. Part of the comedy was that he was willing talk to me on the phone from his Buffalo home or in his hotel room at these sorts of meetings, whether it was an official on-the-record comment or a background briefing. So I was part of the mob out of self-defense more than anything else. When the meetings adjourned, board of governors chairman Bill Wirtz—who I have to say was always helpful to me, despite his spendthrift and curmudgeonly image as the Blackhawks’ owner—confirmed that there wasn’t anything under discussion that would keep the Rockies in Denver. Gilbert said the same thing. 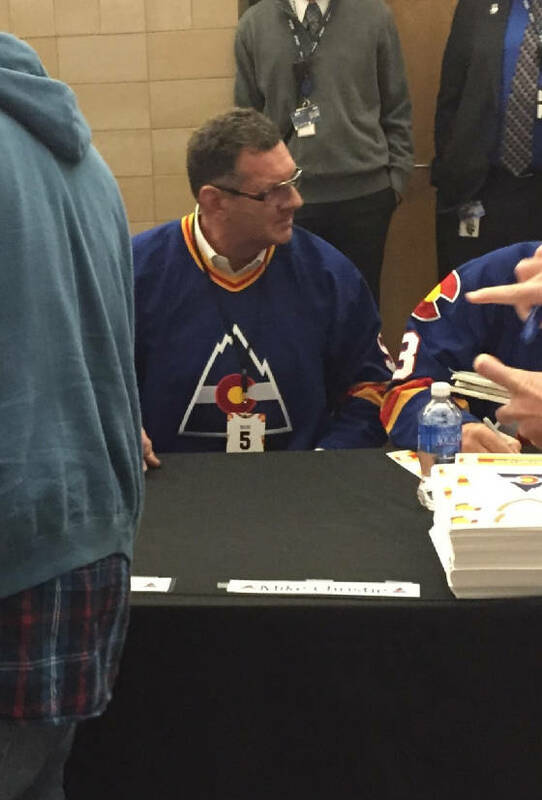 I marveled at how quickly he had gone from being the blustery self-professed savior of the NHL for Denver and even a possible buyer of the Nuggets to a harried, even hapless man trying to get out without losing his shirt. The official end came at another meeting in New York on May 27, 1982. The league approved Gilbert’s sale of the Rockies to McMullen, who at the time also owned the Houston Astros, and two minority partners—Brendan Byrne, former New Jersey governor, and John Whitehead, senior partner of Goldman Sachs. The league also approved a franchise shift to New Jersey. Because it wouldn’t be getting an expansion fee for the New Jersey territory, the NHL forced McMullen to pay compensation to the New York Rangers and Islanders and the Philadelphia Flyers; he also had to pay a transfer fee to the league. Gilbert, who had paid $7.6 million for the team, got $10 million. He said the franchise losses were greater than his profit on the sale. In announcing the league approval of the moves, NHL President John Ziegler said the league tried to come up with owners to keep the team in Denver but failed. “To operate the team in Colorado, based on the financial record, someone would have to be willing to lose a lot of money until the team was turned around,” he said. McMullen said that sounded good to him. “I’m convinced the stadium will be filled every evening,” he said. In reality, the Devils would “underachieve” at the gate, even after Lou Lamoriello had taken over as general manager and built the franchise into one of the league’s elite teams. Back in Denver, we were left to wonder if we’d ever get another shot at the NHL.